Especially when it’s brand new carpet throughout the house….WHY put it in the bathroom? 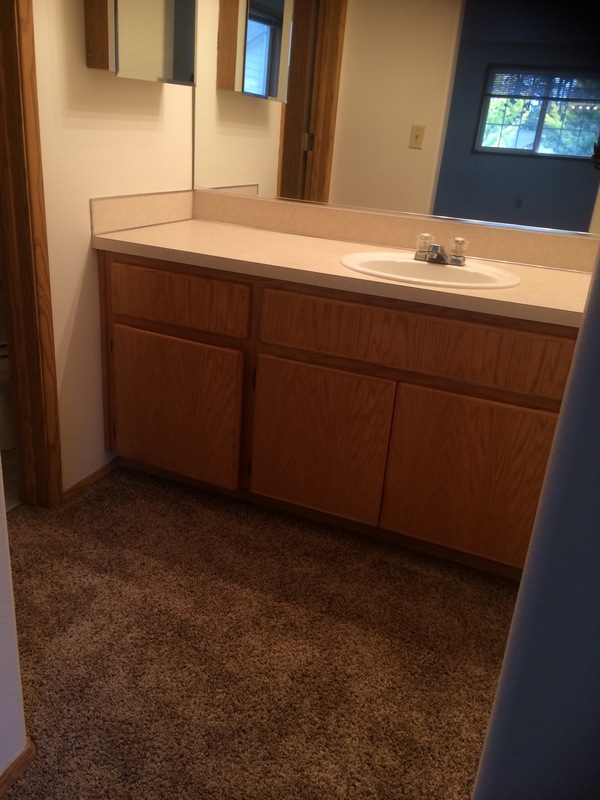 Carpet in the bathroom?!?!?! Agreed, that is THE worst thing to put in that room! You’re just asking for mould galore. With the number of wet feet and dripping water off of you after a bath or shower it collects underneath and you know as well as I do that you don’t see it, you don’t clean it! And the all blue bathroom? Looks very clinical and institutional visually. Having colour in the bathroom is one thing but several shades of the same colour spectrum? EEK! Doesn’t take a genius to know that this is a bad look! When in doubt, all white bathroom with slight colour accents in it! AND NO CARPETS!